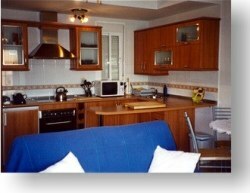 Newly built development(2002)situated in the costal resort of Torrox Costa, Malaga. Torrox Costa is known to have Europe's best year round climate. Many people from all over Europe choose to make this area their home throughout the entire year with an average of over 330 sunny days per year. This is a 2 bedroom, apartment on the 3rd floor of a 3 storey building (lift available and wheelchair accessable). The apartment is of contemporary design and consists of a modern fully fitted kitchen with microwave and built in appliances, it also has all the basic cookware and utencils you'll need to prepare meals. The dining area has a table with chairs for 4 people. The living room has 2 comfortable sofas, sky TV, and CD player. 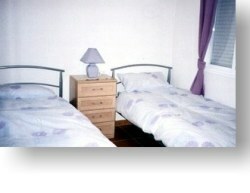 The master bedroom has a quality double bed with large wardrobe. The second bedroom has 2 single beds with ample wardrobe space. There is also a modern family bathroom with shower. Enjoy excellent views of the muontains from the balcony. The beach is only a 5 minute walk away from the apartment. There is also a large communal pool with sun terrace. 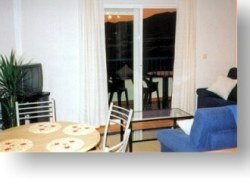 Torrox Costa is located about 55 Km East of Malaga Airport. 35 minute drive via the freeway, or about 50 minutes by public bus from the airport. Airport transfers can be arranged if required.